One of my favourite things to indulge in is whisky. Its diversity of flavours and smells makes my tongue wiggle in happiness with each sip and I am finding myself ever more keen to develop my knowledge of this gorgeous spirit. Over the years of enjoying this drink, I can clearly say I have learned that whisky is dramatic. In fact, seeing as Mirriam Webster defines the word as “striking in appearance or effect” and seeing as whisky is, most often, both – especially the latter after too many top-ups – I was glad to stumbleupon someone seizing on this fact to promote greater education about the drink to the masses. I was curious to find out more and, after an invitation from Mark, headed to one of his latest tastings at the lovely Liberty Lounge on Bell Lane, just down from Spitalfields market. I was not disappointed, nor were the 21 other people who, later, all seemed to compliment Mark’s lecture as they wobbled out the door. But back to the start. The venue was perfect for the evening: trendy but cozy, all dark-wood, dark-banquettes and dark couches, mood-lit by flickering candles. The guests made small talk over the lounge music bubbling across the stereo and the whole place felt far from anything stuffy or old-school. Soon enough, we got down to the evening’s main event: the tasting, which comprised six whiskies. Interestingly, Mark started us out – after a comedic talk on how whisky is made and its history – with a Grant’s, something I haven’t drunk since a rather unfortunate evening as an 18-year-old when I glugged a litre of the stuff with a friend during a beach party in England’s south. 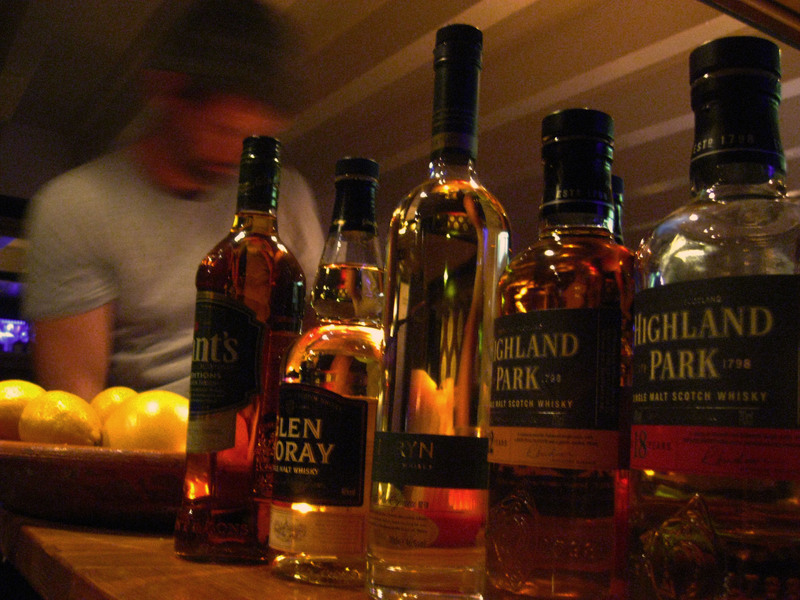 It put me off whisky for a good six years, and I was doubtful of trying it again. Luckily, I was pleasantly surprised: it had nice caramel and vanilla notes, was smooth and left a subtle pear taste of the palate. This was certainly due to the fact it wasn’t any bog-standard Grant’s but a posher, sherry cask finished blend, and my memories of one of my worst teenage hangovers were not brought back. Putting this whisky first was part of Mark’s goal to de-snobbify whisky drinkers who think supermarket-shelf stuff is no good and I think it did the trick. We continued with a light, young, appley Glen Moray; Penderyn’s delicious peated malt (still one of my personal favourites); a rich, sherry-casked 12-year-old Highland Park; a nutty, oily 18-year-old Highland Park; and, finally, a Christmas-cake-in-a-glass 18-year-old Glenlivet. Throughout the event, Mark tried his best to get the crowd chatting and spent much time joking about the attempts of the evil English to control and regulate distilleries in the 18th and 19th centuries. It was an evening choc-a-bloc with interesting information delivered in a relaxed manner, using the latest technology (he brought up pictures to illustrate points on his iPad) in a fantastic hidden-away bar I was very glad to discover. There was even a large plate of flavourful Moroccan food to finish. Thanks for the sharing the experience! Sounds like a hoot! Will have to get along to one and see if it’s anywhere near as much fun as our Whisky Squad tasting sessions! Thanks for the great review.